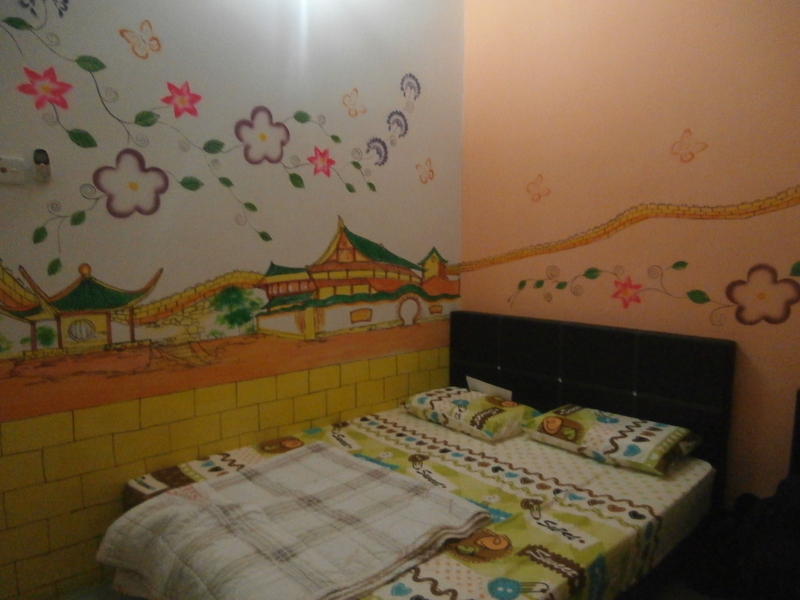 Old Town Guesthouse – This guesthouse gets bonus points for being the best decorated. The walls in the common area are brightly painted with scenes from Melaka. The rooms are all Asian city themed. We stayed in the Beijing Room. This is a budget guesthouse, so it is nothing fancy, but the décor made it seem nicer. It was clean aside from some cobwebs in the corners. There is air conditioning and pretty decent wifi. We stayed in the family room with 3 twin beds and a double bed. My daughters enjoyed the common area when they wanted some time away from us. Simple breakfast is included, toast and jam. Coffee and tea are also available. The host is super nice. He gave us a brief orientation when we arrived and was friendly and helpful the whole time we stayed there. Bathrooms are shared, but are close to the rooms and clean. Since this is a small guesthouse (10 rooms), we never had to wait to use the toilet or shower. Raizzy’s – We stayed in the family room, which had a bunk bed, a double bed, and an mattress on the floor (which we were charged extra for). The room was small with hardly enough floor space for our bags and our bodies. The A/C was sufficient for the KL heat. The bathrooms are down the hall, but we often had to go downstairs or wait because of the number of guests. Breakfast was included, toast and jam, but there was also a long line here too. 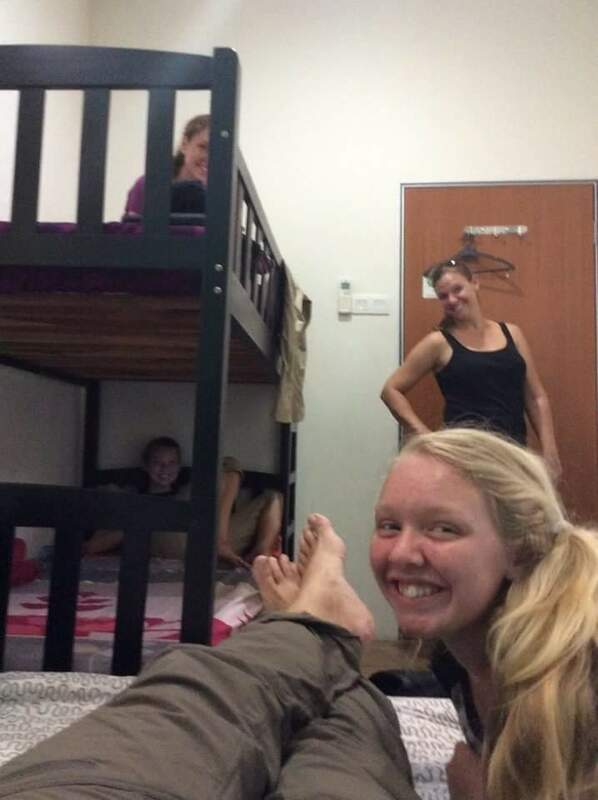 With 36 dorm beds, this guesthouse had lots of twenty-something backpackers. As a famiy of five, we felt a bit out of place. Tucked into our tiny room at Raizzy’s. Tropic City Hotel – After deciding not to stay our remaining nights in KL at Raizzy’s, we walked around the block looking for a new place to stay. The first place we stopped at looked and smelled like a frat house, so we kept looking. At Tropic City, we walked into a cold blast of A/C and a shiny, clean lobby. We assumed it would be out of our price range, but a room with 2 double beds was only RM 138. We were shown the room, 2 double mattresses on a platform with fluffy white comforters. And an attached bath. Three kids sharing a double bed would be no problem. We were sold. The space was tight. The only space for our bags was on the platform at the foot of the beds. We had to climb over each other often to get to our stuff. The wifi in our room wasn’t great, but it was good in the lobby. The front desk workers were friendly and helpful. We were even able to print out our train tickets for free. Uncle Tan’s Bed and Breakfast – For cabins in the woods, this place was pretty nice. The room were big enough. The beds were fine. There is A/C in the rooms. There were only cold water showers, which would have felt nice in the jungle heat, but with the A/C, they were a bit chilly. No wifi in the rooms, but the wifi in the common area was good. My only complaint is that the food wasn’t very good. It was edible and fine for a few days, but after five days (including the jungle camp), I could hardly bring myself to eat it. 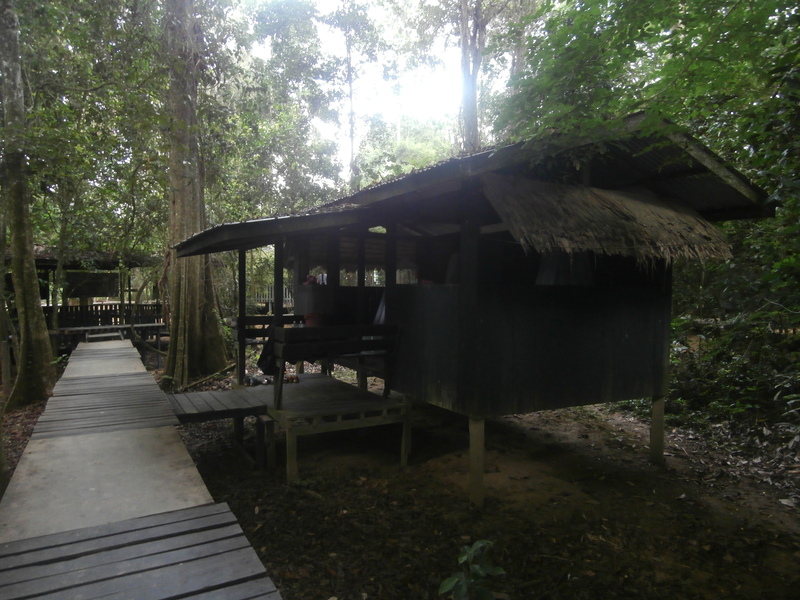 Uncle Tan’s Jungle Camp – A stilted hut. Mats on the floor. Mosquito nets. Pretty much what you would expect from a jungle camp. The bathrooms at the end of the walkway were western style bucket flush. No rain showers, but tubs of river water were available for bucket showers. Huts and mess hall have outlets with power during the day to charge devices. No power at night. Fans would have been helpful during the free time in the afternoon and also at night. Same food as Uncle Tan’s Bed and Breakfast, edible, but not very good. The staff was friendly and did a nice job as our guides. We had cash stolen from our backpacks here, so that was a bummer. We should have known better than to leave cash our backpacks though. Cleaniliness – Not too bad for a jungle camp. *Rand chose this guesthouse and jungle camp after a lot of research. He picked the best company he could find in our price range. My biggest complaint was the food, but I doubt any other company in the same price range would be better. Group tour food is generally not very good. I was also mad that our money was stolen. It may not have been the staff, so I shouldn’t blame this company, but it should serve as a cautionary tale. Just Inn – We stayed in the family room of this small guesthouse (10 rooms) in the old city for just RM100. The room had plenty of space. The shared bathrooms were very clean. In fact, the host was constantly mopping the floors and wiping down the sinks. We never had to wait to use the toilets or showers. The wifi kept going out. One day it was out all afternoon. Sometimes it would come back if the router was unplugged and plugged back in. By the end of our 5 days stay, the wifi worked better. The host was friendly and helpful. The only problem I had here beside the wifi was getting locked in the bathroom stall.